When it comes to removing hair from your body, many questions arise about the most efficient ways to do it. Although body hair is admired and preferred in some cultures, having minimal to no body hair is popular amongst many young Americans. From using pumice stones to plucking to using chemicals to waxing to using lasers, unwanted hair has been removed by a variety of methods throughout the ages. Having excessive hair is a problem for both men and women and consumers spend millions of dollars per year in removal products and services in America. There are two types of hair removal: Temporary hair removal involves the client coming in repeatedly for services. Permanent hair removal involves permanent damage to the follicle, specifically the papilla of the hair. Temporary hair removal methods involve depilation (shaving and chemicals) and epilation (tweezing, threading, waxing and sugaring). Depilation is when the hair is removed from the surface and is the most convenient method to remove hair. Shaving is a daily routine done most by men on the face. Many women who shave typically shave the underarms, legs, and bikini area. Unfortunately, shaving can irritate the skin, causing ingrown hairs, razor burn, and infected follicles. Another form of depilation that is used are depilatory creams, a substance used to remove the hair by dissolving it at the surface. These products can also irritate and possibly burn the skin if you have allergies or sensitive skin. Before using these products, make sure to do a small patch test on your skin before applying it all over the area. Epilation methods are becoming a lot more popular. An old school method is tweezing, which you use tweezers to pull out the hairs out the root one at a time. This is commonly done on the face around the eyebrows, lips and chin. Although effective, this is a very slow method of hair removal. Threading is another popular form of epilation. This is a common practice of many Middle Eastern cultures. This method is done by using twisted cotton thread and rolling it along the surface of the skin, which snags the hairs out of the follicle. This is a very inexpensive method of hair removal since it requires minimal supplies. Waxing, the primary hair removal method used by estheticians, is very popular amongst hair removal clients. Made primarily of resin and beeswax, epilating wax is applied over the hair and removed. Two types of wax are used: hard and soft. Hard wax, when applied, suctions and wraps around the hairs and then pulled out. This type of wax is recommend for more sensitive areas of the body such as the face, underarms, and bikini/Brazilian. Soft wax, when applied, adheres to the skin and is removed by a strip. This type of wax is more likely to exfoliate your skin, so it is recommended to be used on the legs, arms, back chest and abdomen. Using soft wax on the face, underarms or can potentially lift the skin. Make sure you tell your esthetician if you are taking any medications, as they be a contraindication. Laser is a newer method of removal for unwanted body hair. Many people believe this method is permanent, however, the proper term for this service is “permanent hair REDUCTION”. This method virtually reduces hair growth, however, the hair will grow back if it not maintained. A laser is used to target melanin within the skin and burns the dark hairs at the follicle. For this reason laser hair removal does not work on blonde and grey hairs, and there must be a contrast between your skin and your hair. This service is more expensive than the other temporary hair removal methods, so make sure you are a good candidate for it. Some contraindications include pregnancy, epilepsy, and recent chemical exfoliations. Although there are not many various permanent hair removal methods, electrolysis is widely known as an effective method. Electrolysis is the process of removing hair by means of electricity by inserting small needles into the hair follicles. 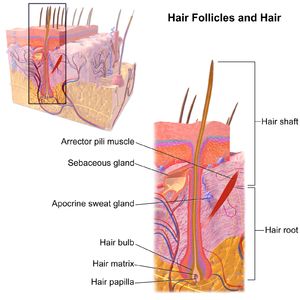 The electric current causes chemical decomposition of the hair follicle at the papilla, which nourishes the hair. Multiple treatments are required. When it comes to beauty preferences, there is a hair removal method for every budget. The more permanent options are relatively more expensive, but some of the temporary options can provide an efficient delay for the regrowth of hair. Do your research to find a method that fits your needs. Make sure that the person who is performing these services is a licensed professional and is abiding by the state laws.